THROUGH THE WOODS – The view from behind the dog sled team. Seeing how these animals work together was one of the coolest things I have ever seen. Hello everyone. I thought today I would try something different, and talk about one of the coolest experiences I have had so far while living in the Yukon. As well since I have only lived in Whitehorse for a month, I thought why not introduce myself and speak to what I have seen so far in the sport scene. I moved to Whitehorse from Hamilton, Ont., not really knowing what to expect. Admittedly I have only lived in larger cities throughout my life. Let me say, Whitehorse you are wonderful, the interactions I have had so far have all been positive experiences. This is especially true of the sport community. I grew up in sports and have been involved in them from, player, to coach, to fan – basketball and volleyball being my main two. I have always believed sports to be a great unifier of people. Those in any sport will know that they bring together a diverse group of people and although you may disagree with them on any number of things, when it comes time to take to the court, rink, field, what-have-you, you will always have the love of the game in common. Now I mentioned I have only been here a little over month, and I know full well that I have not even begun to scratch the surface of the sports world here. But to those organizations and people I have been fortunate to cover so far, you have all been very welcoming and accommodating, and it is easy to see the passion everyone has for their chosen discipline. It’s refreshing. A common theme I have begun to pick up on when chatting within the community, is the desire to grow their respective sport in the Yukon, purely opinion but it seems to be on track here. Being involved in the sport scene back home, development and growth of the game seems to take a back seat to results, which is often shortsighted. It isn’t easy to grow a sport, it takes a lot of work and strong long-term planning, which starts at youth development and ends with coaching. I tend to view sports as a lifelong commitment. You start as a kid in a variety of sports. As you get older you may specialize and take your chosen game as far as you can go. Once finished one tends to get into coaching, drawing on all past experiences to teach a new generation. To all I have covered and to all I will cover, you all seem to have strong long-term outlooks that will benefit your sport. Before moving to Whitehorse, I had always imagined coming to visit, because I have always wanted to witness dog sledding. It was one of many reasons I decided to move here. Over the weekend, along with my Zia (Aunt in Italian), I not only got to witness dog sledding, but I got to try it out. 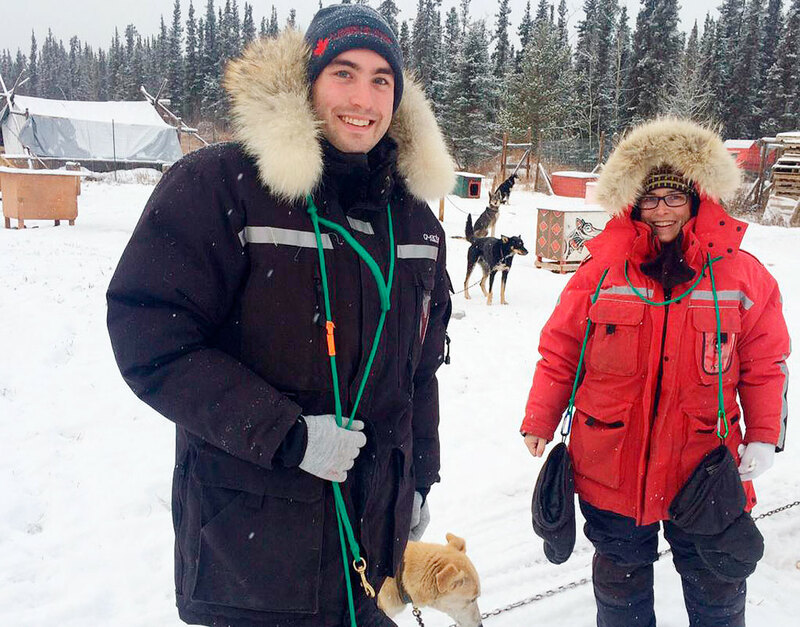 My Zia and I made our way to Alayuk kennels, to be taken on a 10-kilometre training run by 2012 Yukon Quest and 2014 and 2015 Iditarod finisher Marcelle Fressinau. 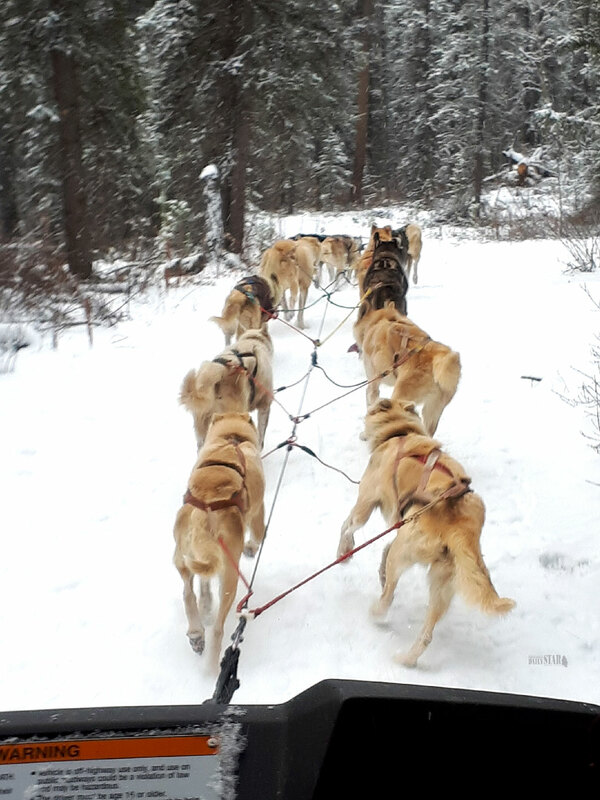 Without enough snow we were pulled by a team of 12 dogs while riding in a side-by-side. I tend to consider myself a lucky guy. I have been fortunate enough to do my studies in Scotland and do some extended backpacking trips across Europe, seeing some pretty cool things along the way, like the canals of Venice, the Highland Games and a football (soccer) match in Olympic Stadium in Berlin. In no means do I mention this to brag, I just want to be able to put my experience in the side-by-side into some perspective, because it was incredible. Human and dog working together to achieve a common goal was magical, and is certainly in the top three coolest things I have experienced. It truly was beautiful. It may have been the cold whipping me in the face as we raced through the forest, but I am pretty sure a tear may have crossed over my cheek. I didn’t know what to expect when I got there, but to see the relationship and camaraderie of human and animal was something I will not forget. The entire ride, I just kept thinking, this is wild, I can see how people become hooked on this - about the only coherent things I was able to muster up really. To see the dogs in action, wow, you could tell how into it they were, every time we stopped they were just itching to go again. As the ride came to an end, and I was able to pet and play with the dogs, I couldn’t help but think I made the right choice coming to the Yukon. Really though, I knew I made the right choice, after my first couple weeks on the job, after interacting with the different sports communities. This just happened to be the exclamation point on it all. Thank you for letting me share with you all. I look forward to continuing to meet all the different sporting groups as we move into winter. Come say hello if you see me at any events, I’ll be the one who hopefully looks like a journalist. Welcome to the Yukon. I'm glad you took the time and got a chance to meet some of our finest athletes. Looking forward to seeing you out there and reading your articles.